Japanese made products used to be synonymous to 'cheap' and 'poor quality.' 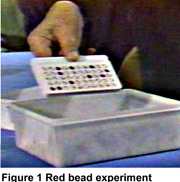 It was not until July 1950 when Dr. Edwards Deming (1900-1993) introduced SQC to the Japanese industry audience, using the trademark colored-beads experiment. Eizaburo Nishibori, one of the country's post-war quality pioneers, describes in a book* the humble initial encounter to modern quality concepts that preceded Deming's historic 8-day seminar. It was during American occupation of Japan (1945- 1952) when GHQ (offices of the Allied occupation) placed an order of vacuum tubes to Toshiba. Nishibori recalled the American officers wanted to see a 'control chart' from the manufacturing process being used to produce their order. No one at Toshiba knew what it was. "You don't know a control chart? How do you plan to manage quality?" Nishibori remembers replying, "If we, engineers at Toshiba, don't know it, most likely no one in Japan knows." Soon after this incident, the GHQ officers began giving lectures to their Japanese vendors, using QC books procured from their Washington D.C. office. Only two students attended at first, Nishibori from Toshiba and Nishio from NEC, with neither of them comprehending much of what was taught. Later others joined, but a doubt lingered about the usefulness of QC and such seminars. "It looks like statistics, is QC statistics?" the students asked. This was the first time the Japanese ever heard of "Statistical Quality Control (SQC)." Nishibori remembered thinking, "Hmm, is this what Americans are doing now? How do I find out more?" Meanwhile, another learning opportunity was set in motion by the same American GHQ. It was they who arranged Dr. Deming's first visit to Japan, to teach sampling methods to the post-war Japanese government that was about to conduct its first national census after the war. However, the cabinet level statisticians resisted the new idea and opted for an old fashioned 100% survey. It took about a decade for the Japanese to understand Quality to the point where they began to see that they must address both 'target quality' and 'finished quality' in order to produce superior products. Nishibori especially stressed the importance of target quality, although SQC and SPC deal mainly with the finished quality. While it was the responsibility of the top management to set the target quality, it was the responsibility of middle management to disseminate it through the corporate hierarchy, usually with the use of a carrot and stick. In those days, there were no systematic ways to identify the target quality coherently or to assure it throughout the organizational process. We have come a long way since then. QFD concepts developed by Drs. Shigeru Mizuno and Yoji Akao in the 1960s have made it possible for companies to benchmark, analyze, plan and execute the quality targets visibly throughout the system — prior to the phases needing SQC and SPC, and with customer focus. With Modern QFD tools, you can uncover the unspoken needs and expectations beyond the stated customer verbatims; you can prioritize and translate them into business goals; and you can do all this in compliance with the rigor of Design for Six Sigma (DFSS), and with or without a cumbersome matrix. SQC and SPC are still the gold standard of quality, be it for managing the stability of a manufacturing process or checking the quality of finished goods. Six / Lean Sigma is credited for enhancing the range of application, tools, and statistical understanding. And yet, once equilibrium is attained using these techniques, the only way to further level up your quality and even add unexpected excitement to your new product and service is to better plan the target quality, further upstream. That is where you cannot go without Modern QFD. Read more ... "Influence of Dr. Deming in QFD"
Copyright © QFD Institute. All rights reserved. QFD Gold Belt®, QFD Green Belt®, QFD Black Belt®, QFD Red Belt®, and Blitz QFD® are registered marks of the QFD Institute.